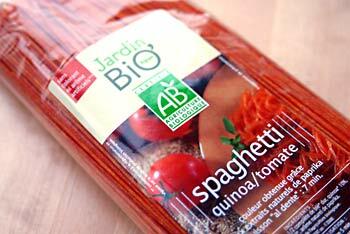 When we were in France, we saw this lovely tomato quinoa spaghetti in a bright orange color. Organic and vegan – so of course we were interested in buying and trying it. We found it very tasty and want to try to make it ourselves soon. Add the minced garlic and cook until they are soft. Add the rest of the ingredients and let simmer to season. Select enough quinoa spaghetti for 2 people and place in the water. 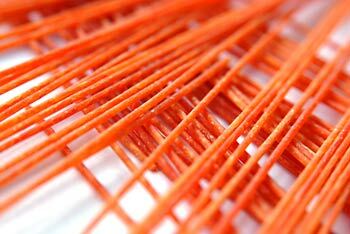 The quinoa spaghetti only needs 3 or 4 minutes to cook. 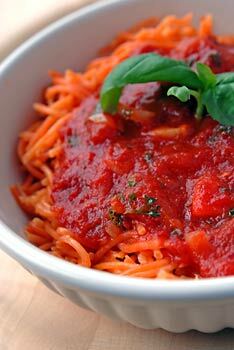 Serve the quinoa spaghetti with the sauce on top. Posted by Chris Walker on February 23, 2007 in Main Dishes, Meals, Quinoa, Tomato.